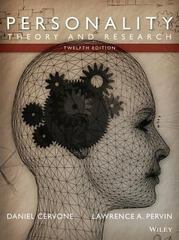 Personality 12 Edition Now in a new edition, this book expands on previous editions on the study of personality and neuroscience. It draws on research on the biological foundations of personality and trait-based research including investigations of neural mechanisms in defensive information processing as well as brain systems critical to self-concept. The text introduces questions of personality-and-brain along with biological foundations. It explores each of various theoretical issues at a new level of investigation, that of brain research to provide a more up-to-date look at the field.